A nice RV park for travelers with animals. Tomorrow is the day we leave for our summer volunteer position with the National Park Service at Petrified Forest National Park in Northern Arizona. The first leg of the trip is 359 miles from home in Dallas Texas to Amarillo Texas. We are headed for the Overnite RV Park right outside Amarillo. This is the best park ever if you travel with your dogs. You may request a campsite with a dog corral that is just for your use. 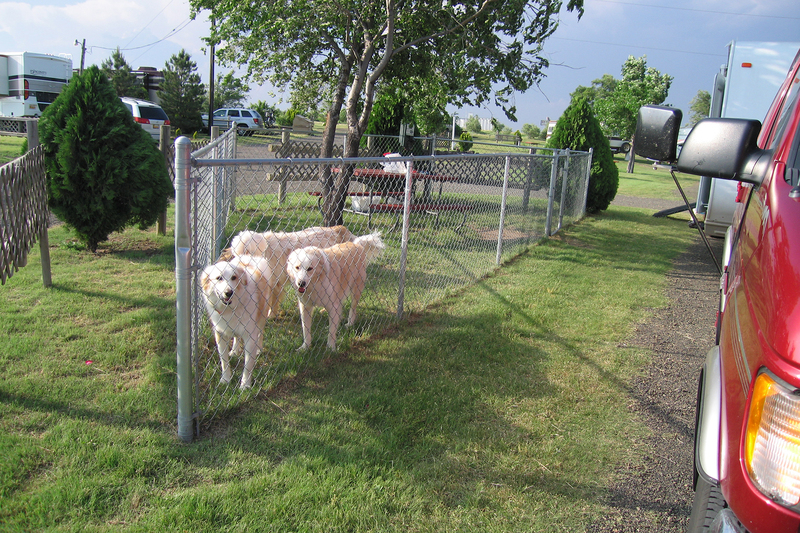 There is no extra charge just call and ask them to reserve a site with the dog pen. For a roadside RV park this is a pleasant and fairly quiet place to spend the night. I will try to get some pictures tomorrow night of that wide open West Texas sky. This entry was posted in National Parks, Volunteering and tagged Amarillo, Lone Star Travelers, Painted Desert, Petrified Forest National Park, road trip, RV Park, West Texas. Bookmark the permalink.